Why did the Moon move the wrong way in the movies? In order to understand the motion of the Moon relative to the Sun in the PROBA2 movies, we have to understand both the orbits of the Moon and the PROBA2 spacecraft. The Moon orbits the Earth in a west to east direction. You can confirm this for yourself by noting the time of moonrise on successive nights. Every night the Moon rises later than it did the night before because every night the Moon is a little further east in its orbit than it was the day before. As a result, the Moon will be a little farther over the eastern horizon today than it was yesterday, and it will rise a little later as a result. That means, for an observer on the ground, looking at the Sun and the Moon moving relative to each other, the Moon first covers the western part of the Sun and slowly progresses across the solar disk to the east as its orbit carries it in the same direction. Meanwhile, PROBA2 orbits the Earth in what is called a sun-synchronous dawn-dusk orbit. It follows the terminator — the dividing line between night and day on Earth — all the time. As a result, the Sun almost never rises or sets from the perspective of PROBA2, and the spacecraft has a clear view of the Sun 24 hours a day. This means two things for PROBA2: First, it means that on the dawn side of its orbit, the spacecraft travels from south to north. It crosses the north pole and then orbits on the dusk side from north to south. Second, it means that relative to an observer on the Earth the spacecraft is always traveling from east to west to keep up with the rising (or setting) Sun. However, the westward motion is much slower than the polar-directed motion. PROBA2's trajectory during the first passage through the eclipse. PROBA2's trajectory during the second passage through the eclipse. The images above show PROBA2’s orbit during the two eclipses it witnessed on Friday. Let’s consider the first passage first, this is shown on the left. 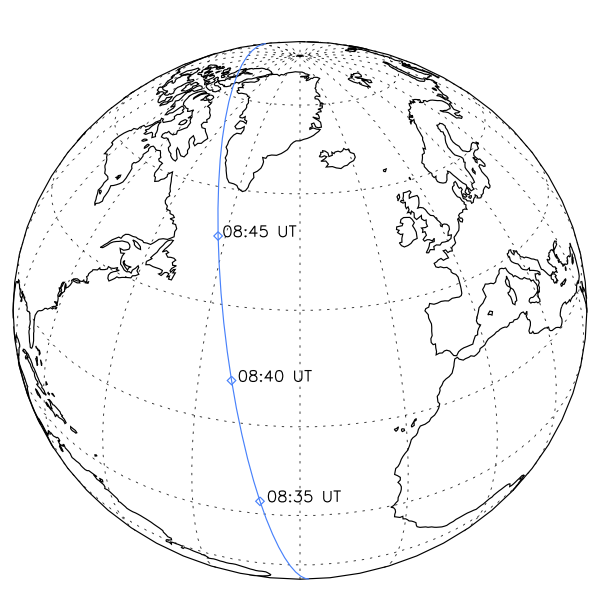 At this time, PROBA2 was moving from south to north, some 700 km above the Atlantic Ocean. As we mentioned above, in addition to the northward motion, its orbit was carrying it slightly to the west as well. PROBA2’s motion from south to north means that the Moon’s silhouette in the images should move in the opposite direction. Eclipse observers far to the south of totality saw the Moon to the north of the Sun (as we did on the ground in Europe). Observers on the line of totality saw the Moon cross the Sun exactly. Observers to the north of totality — if there were any — would have seen the opposite, with the Moon to the south of the Sun. A map of the 2015 March Eclipse showing the progress of the Moon's shadow across the Earth at various times. The shadow is distorted where the eclipse is seen at dawn or dusk due to the curvature of the Earth. As you can see from the map above, PROBA2 was located, at various times during its first passage through the Moon’s shadow, in all of these positions, at later and later times. This explains the Moon’s motion from north to south in the first eclipse passage. But what about the fact that the Moon moves from east to west in the PROBA2 view? During both of the eclipses it witnessed, PROBA2 was moving from east to west, while the Moon’s shadow was moving the opposite direction. So one might think its motion would carry it through the Moon’s shadow similarly to an observer on Earth, but faster, due to the combined effects of the westward motion of the spacecraft and eastward motion of the shadow. Moreover, one might think that the Moon should appear to move west to east, just as it does for observers on Earth for the same reason. This is not the case. Because of PROBA2’s dawn-dusk orbit, the spacecraft can never witness the eclipse near its midpoint on the ground, but only on the edges of the spherical Earth, along the terminator where sunlight falls least directly. In this position, as anybody who has noticed their own long shadow in early morning or late evening has noticed, shadows become strongly distorted by the highly oblique angle at which the Sun’s rays fall on the Earth. However, over the Atlantic, where it was dawn during the eclipse, the Moon’s shadow was not a circle but a stretched ovoid shape, and the motion was much more in the northerly direction. As a result, even though PROBA2 was moving slightly east to west, it actually started its pass through the shadow on the west (and southern) side of the Moon’s shadow, viewing, essentially, the end of an eclipse over the mid-Atlantic. 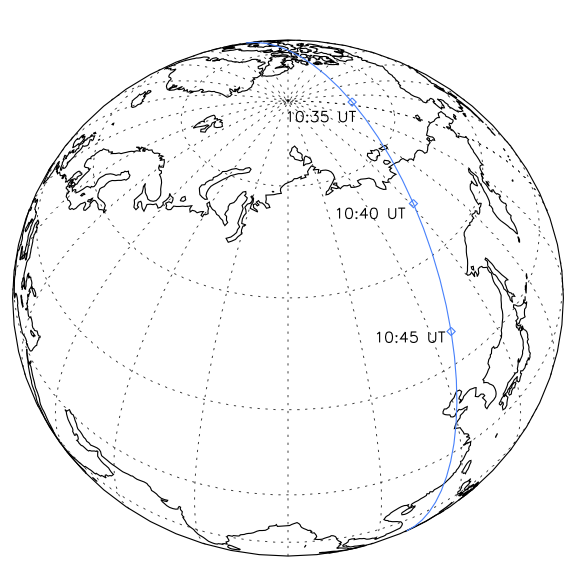 As the spacecraft zoomed north, it zipped through the lunar shadow and eventually ended up on the east (and northern) side of the shadow, at the beginning of an eclipse not far from Greenland. As a result, the Moon in the PROBA2 movie appears to move east to west, rather than west to east as it does from the ground. A quick comparison of the second passage through the lunar shadow and the map above shows the same effect plays out again, except with the spacecraft traveling from north to south, thus again the Moon moves west to east in the movie, but this time it also moves south to north. Why don’t we see any solar rotation in the movie? 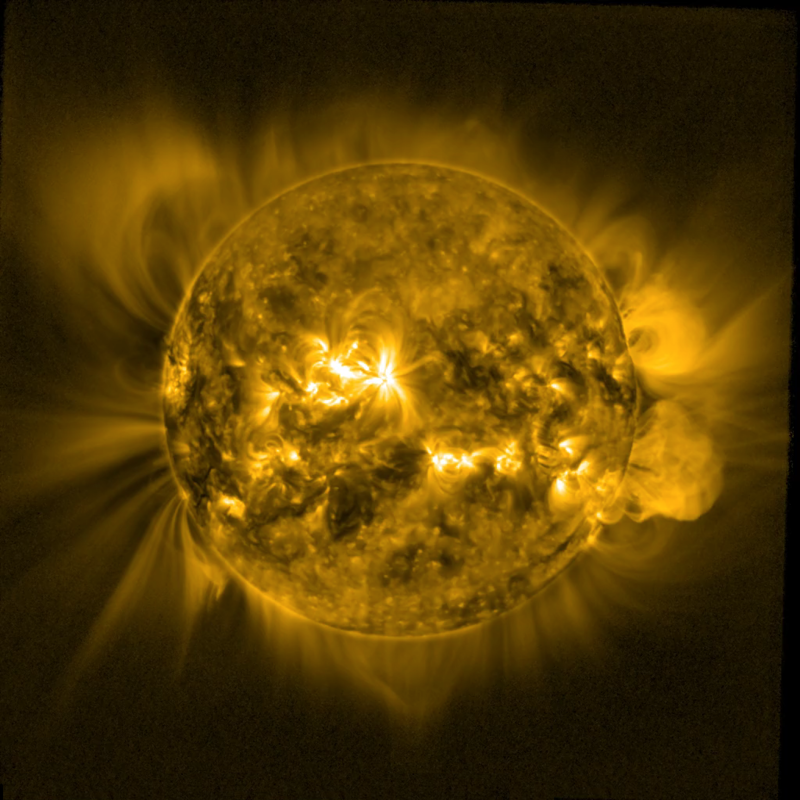 Many people are used to seeing the Sun rotate in long time-lapse videos of solar activity. These videos often compress several days of time into just a few seconds, giving the impression the Sun is rotating a considerable distance in just a short amount of time. But how fast does the Sun actually rotate and how much should we expect it to move in a video of an eclipse that lasted roughly 30 minutes? The Sun is not a solid body — it’s a fluid in which the equator rotates faster than the poles — but it does rotate. Most people say the Sun rotates once every 27.25 days based on measurements Richard Carrington made of sunspots in the 1850s. So for the remainder of this section, this is the number that we will use. 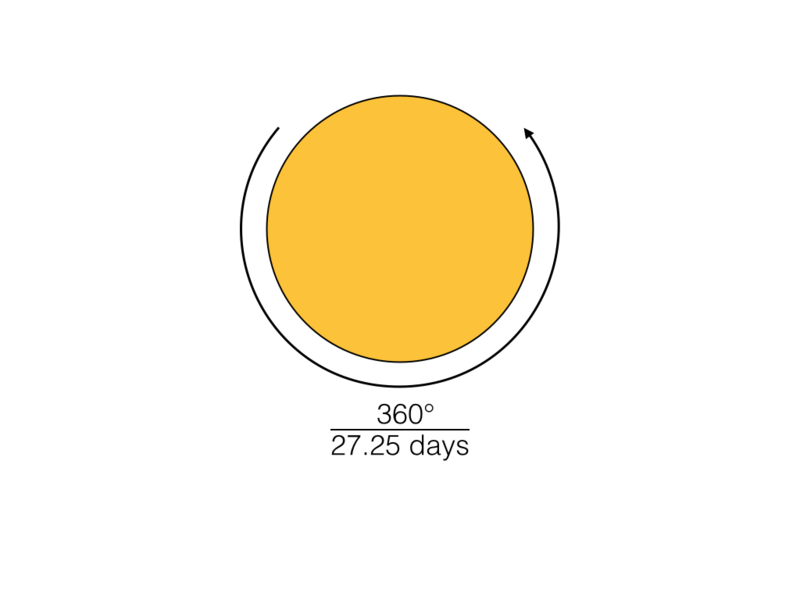 If the Sun rotates 360 degrees in 27.25 days, we can easily calculate that the Sun rotates about 13.2 degrees in one day. Since a day lasts 24 hours, we can use the unit analysis shown above to find that the Sun rotates about 0.275 degrees in 30 minutes. How much will the Sun’s appearance change because of that? One way to answer that is to ask how much a feature on the surface of the Sun would move in a SWAP image of the Sun in that amount of time. To know this, we have to calculate the circumference of the Sun. 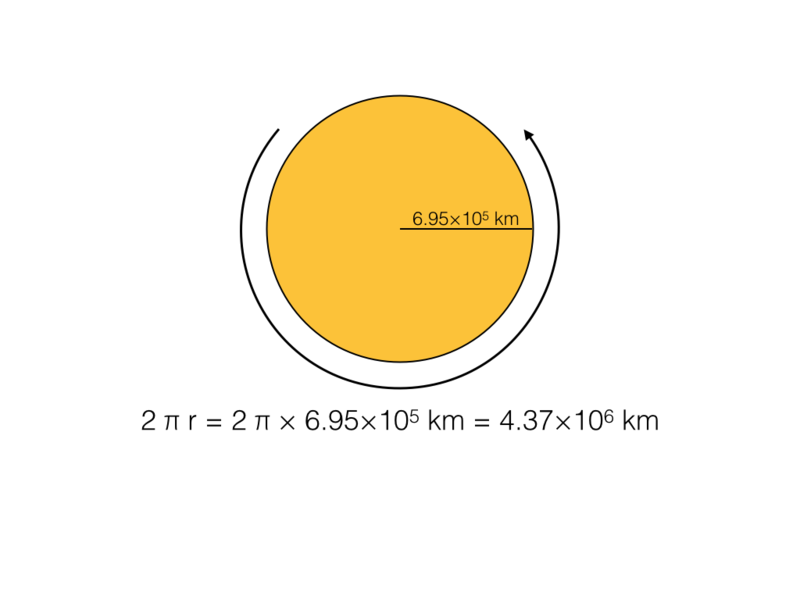 We know that the solar radius is about 695,000 km, so it’s straightforward to conclude the Sun’s circumference is 4.37 million km. How much does the Sun move in 30 minutes then? Well, 0.275 degrees is just under one one-thousandth of a full rotation, so the answer will be roughly one one-thousandth of a solar circumference. 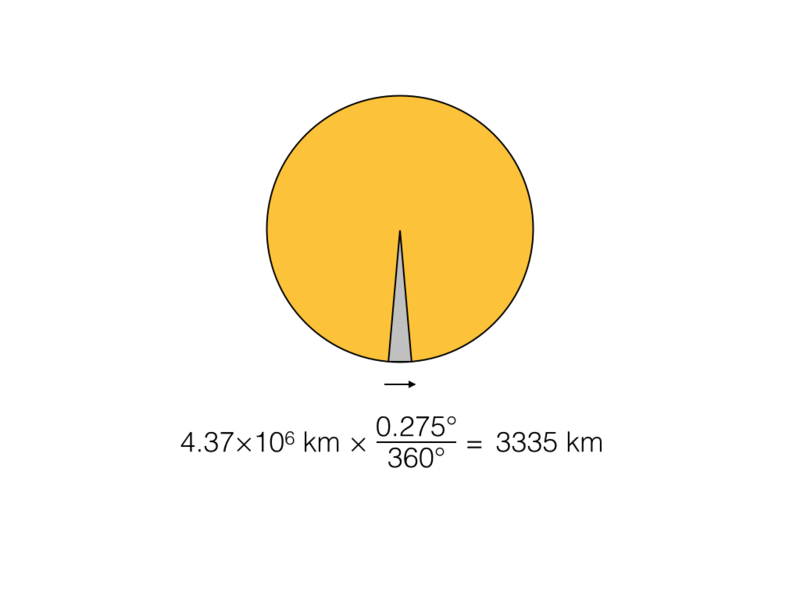 A quick multiplication tells us, more exactly, that this represents about 3335 km of real motion on the Sun. That’s a big number, but only on a human scale. On solar scales, this is a very small number. 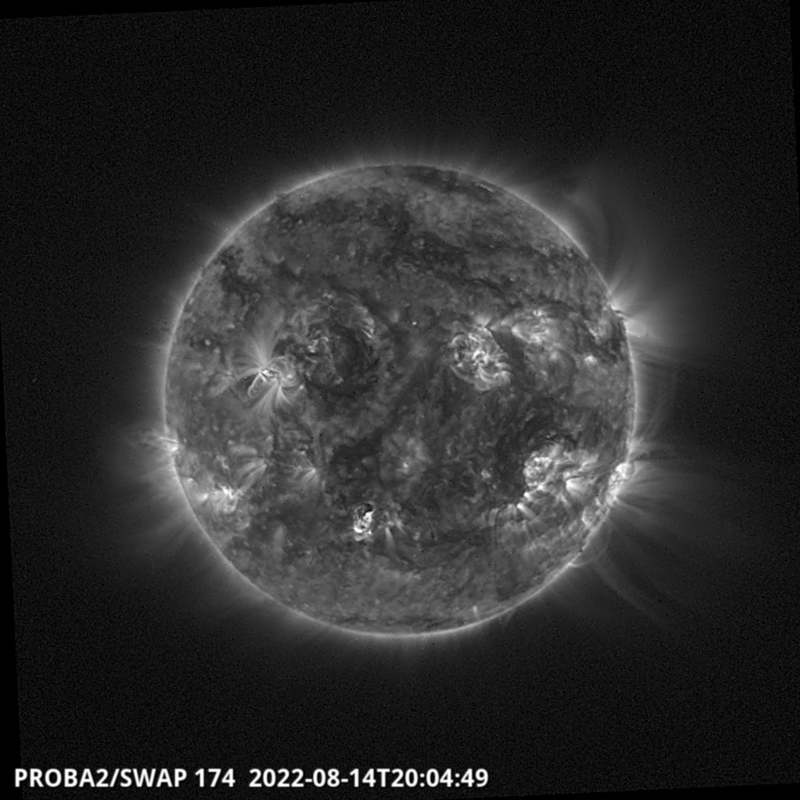 So how much will a SWAP image change in 30 minutes thanks to solar rotation? 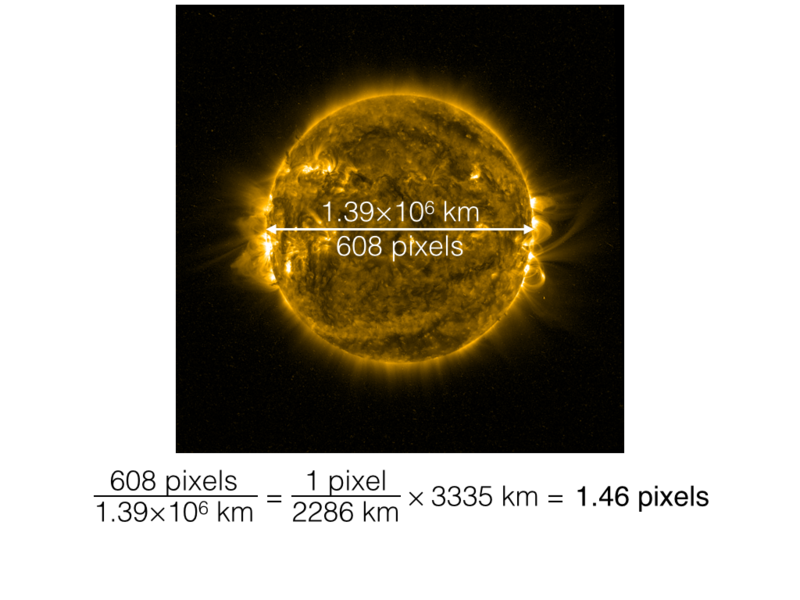 Let’s see if we can convert linear distance on the Sun to something we can observe with SWAP, like the size of a pixel. We can find how wide the Sun appears in SWAP pixels by direct measurement, and we know how wide it is in kilometers (two solar-radii or one solar diameter), so we can compute how much linear distance one SWAP pixel represents straightforwardly. So why doesn’t the Sun appear to rotate at all during the short eclipse video? Because the Sun’s motion is just barely perceptible to PROBA2 in 30 minutes. Why isn’t there any solar activity visible during the movie? The first two questions we studied were just matters of geometry. But what about solar activity? Surely we should have seen more changing on the Sun over 30 minutes, right? To quantify how much the Sun changed, we took the two SWAP images closest to covering this timespan for every day and computed the pixel-by-pixel difference. The result will always be something like the image below. 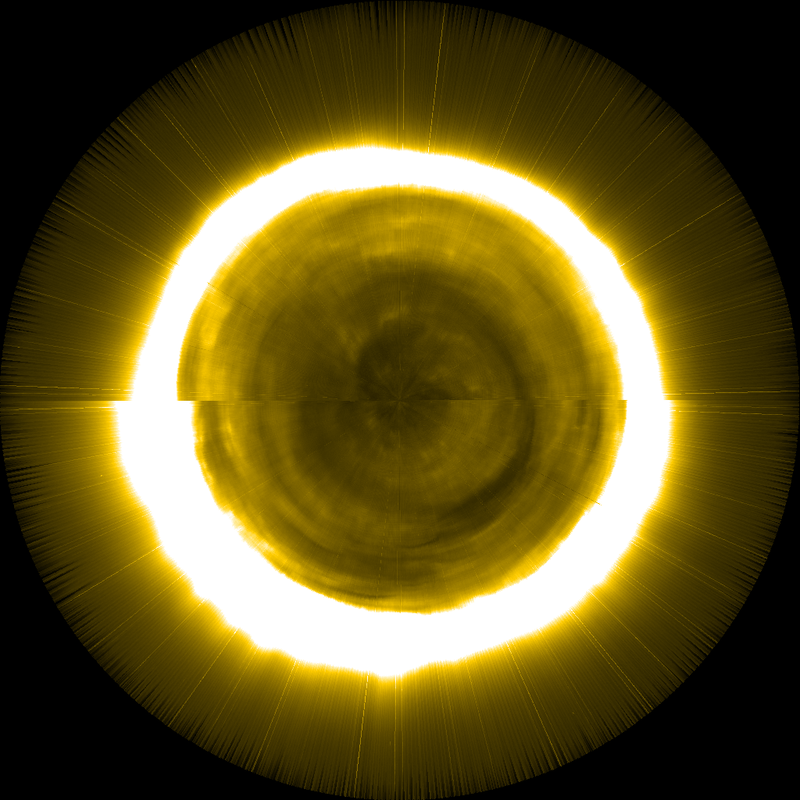 An example of a pixel-by-pixel difference image based on real SWAP images from the time of the eclipse. The black areas in this image represent places where the brightness has decreased between the time of the first image and the time of the second. The bright areas are regions where the brightness has increased. Gray represents areas where there was little or no change. By computing the absolute value of every pixel in the image and then computing the average value of the entire image, we can get a rough estimate of how much change there has been overall in the corona due to solar rotation (not much, as we’ve seen above), motions of loops and other structures in the corona, and brightenings or dimmings. The more the corona changes, the larger this value will be. To get a sense of how much (or how little) change occurred during the eclipse, we compared the computed value from the eclipse sequence (which turns out to be 1.456) to the amount of change we see in every other image in the series. We can plot these values in a histogram, which is a graphical method to display the number of times a particular value — or, in this case, a particular range of values — turned up in the data. 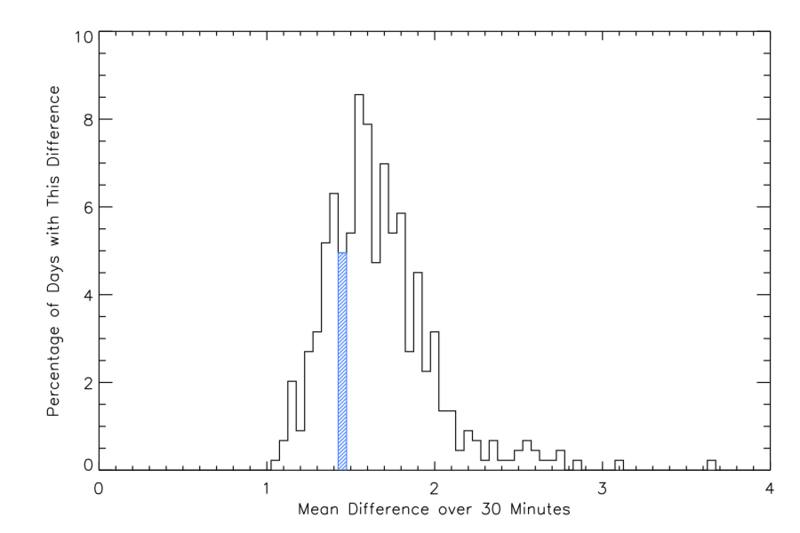 Histogram of average image change during the period between 8:25 and 8:55 UT for all PROBA2 observing days since the beginning of 2014. Our value for the average amount of change fell in the blue-shaded bin. As you can see, our value is at the low end of the histogram, but by no means the lowest. 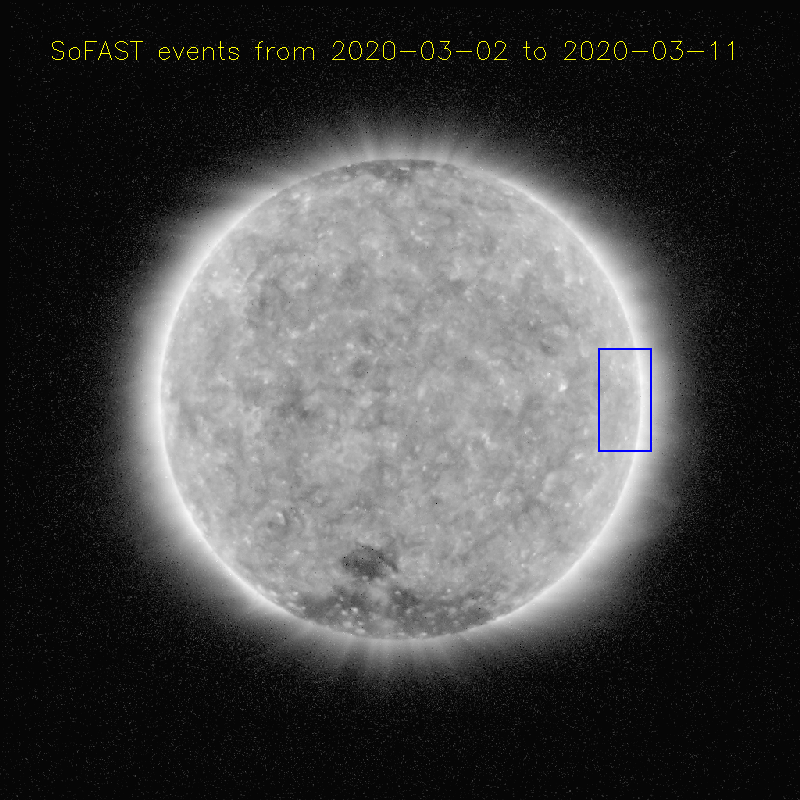 Every day we sampled has at least a little change (the value zero never occurs) and this is to be expected: the small amount of solar rotation that occurs in 30 minutes and statistical variations in SWAP’s camera would induce some small change, even if the Sun was totally static. The more the Sun changes, the larger the value. It turns out that the March eclipse value is roughly in the 28th percentile of all values, so more than 70% of the cases we looked at changed more in 30 minutes than what we saw over the eclipse. However, many cases changed less as well. The bottom line is that this day was a little low in activity, but not particularly unusual compared to other days. 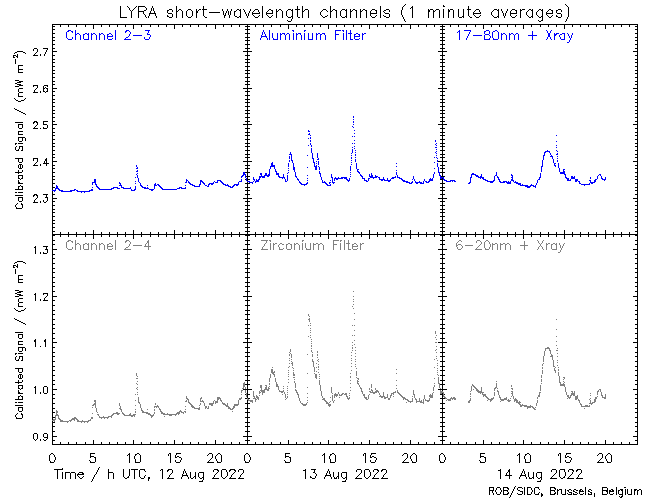 Those who wondered why the Sun didn’t appear to be more active would probably have asked the same question if they looked at any “normal” 30 minute period on any arbitrary day. Why did the SWAP movie play so fast? Indeed, it is true, the SWAP movie played very fast, but there is a good reason for this as well. SWAP is not like a consumer video camera that can shoot 25 frames per second (or even more). Instead, the movie has to be composed of whatever still frames we can capture given the limitations of photographing the Sun from space. Which raises an important second point: SWAP is in space, so you can’t just make a long movie or series of images and pull out the SD card and stick it into your computer to watch it. For SWAP’s camera — which is a sophisticated, space-qualified, radiation-resistant camera, but uses the same APS technology in many consumer cameras — to transfer an image from detector to memory takes about seven seconds. That means, in the absolute best-case scenario, the fastest we could ever hope to take images is about one every seven or eight seconds. But this rate would only work if the Sun were very bright in the EUV, much brighter than it actually is. So in addition to the seven seconds to store an image, we need to actually acquire the image for about ten seconds to gather enough photons to see the solar corona clearly. So the fastest SWAP could operate in perfect conditions would be one image every 17 seconds. But there’s another complication. SWAP can only store a few hundred images in its on board memory, and can only transfer images to the ground when it is in sight of a satellite ground station. For PROBA2 this means basically a small satellite dish connected to a computer that reads a radio signal from the satellite and converts that signal into data. SWAP has two ground stations, one in Redu, Belgium, and one on the island of Svalbard. During each ground contact, SWAP can beam a few dozen images to us, so even if we could store every image on board that we could ever want, we still could only get a small number of them to the ground. 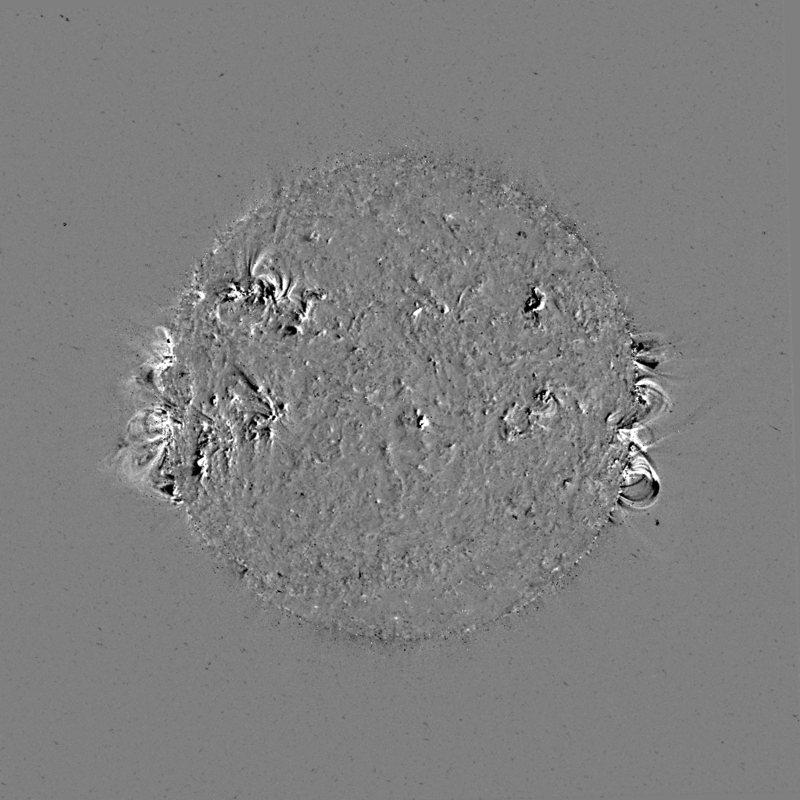 On eclipse day we had seven ground contacts after the eclipse began with which to get all the images we acquired — that includes nice images of the eclipse PROBA2 saw, images of the Sun at the time of totality on the ground and other special science campaigns to support eclipse observers. Given this constraint, in order to ensure we got as many images on the ground as possible, we had to adjust the rate at which we acquired images yet again. There’s no point in taking pictures rapidly if you never see them on the ground! So we opted to take one image per minute for the full duration of the eclipse. That means we got about 20 images between 8:25 and 8:55 in which we could clearly see the Moon’s silhouette in front of the Sun. But there is yet another complicating factor: the spacecraft rotates every 25 minutes in order to keep itself stable and correctly oriented! Thus two of these images were lost because the spacecraft rotated and this motion blurred the Sun. Thus we ended up with just a little over a dozen frames showing the eclipse. So why was the movie so short? Mainly because the limitations of operating a scientific space mission means making compromises3. We’d love more images of the beautiful eclipse, but we had to make a tradeoff to help support the interesting and important science projects observers on the ground were doing. But that’s the nature of space-based scientific research and we’re nonetheless very pleased with the fantastic eclipse images we did manage to get, one of which you can see below. One of the final SWAP images of the eclipse. 1Making and interpreting maps of solar eclipses is complicated business, which we cannot explain in detail here. More information about the map seen here and how to interpret it appears at www.eclipsewise.com. 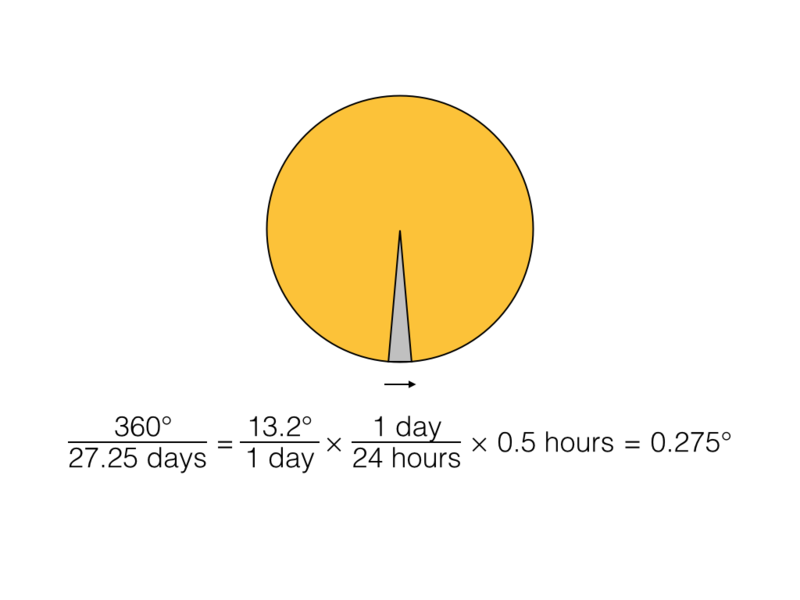 2This is a quick and not terribly robust way to do this calculation, which provides a very rough estimate of the amount of change to expect in images of the sun over the course of 30 minutes using a limited amount of data. (Even so the calculation takes into account more than 1 GB of data.) A more comprehensive study could be tuned to use much more data or even make estimates of the amount of change expected over a wider range of times. 3This is not the only set of compromises we had to make in designing the SWAP eclipse campaign. To read about some additional challenges of working with SWAP you can read about the so-called ghost effect on our main PROBA2 Eclipse page.